7. Will I lose all Product data if I reinstall it? 8. The Demo that we have downloaded has now expired and we didn't get the chance to test it properly. Is there any way that we can download and try it again for another 14 days? 9. I have downloaded the product trial a month ago and now I am trying to install it. But I get message that "Your trial is over". What should I do? 10. How do I update from the previous product version to a new one? 11. I receive an error that reads, "There is no email program associated to perform the requested action. Please install an email program or, if one is already installed, create an association in the Default Programs control panel." How do I fix this error? Yes, you need to have Administrator rights to install iCal Converter. Please send an extension request to support@4team.biz. Please provide your name, phone number, and your team size and describe the purpose of the extension. Please refer to 4Team support by e-mail or via live chat. You must uninstall the previous version (go to Control Panel Add or Remove Programs) and download and install the new one. Couldn't be more happy because I’ve got what I always needed. 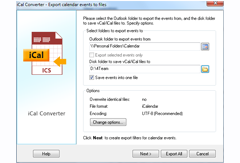 Calendar transfer was quick and painless... Lots of my coworkers need to move their Outlook calendars to other devices, I will..."